"He who wonders discovers that this in itself is wonderful"
All Articles Copyright 2000-2002 William L. Saylor. All rights reserved. Reprinted with Permission. Mexico: The highly decorated step pyramids at Chichen-Itza, Monte Alban, and elsewhere. In the Temple of Inscriptions at Palenque, a shaft runs from the tomb up to the temple floor, similar to some of the Egyptian pyramids. There was initially a 40 ft "comb" on the top. Was this an additional identifying marker? Mexico: The huge, unexcavated pyramid at Cholula (Fig 4-1), in the shadow of the volcano, Popocatepetl ("El Popo"). Its ancient name, Tlachihualtepetl, means "man-made mountain". On Quetzalcoatl’s pilgrimage his first stop was Cholula, which means ‘the place of flight’ in Nahuatl. The huge "Piramide Tepanapa", 200 ft high and 1300 ft on a side, is the largest ancient pyramid in the Americas, and possibly the largest in the world. The earliest construction has been traced to 200 bc. It was covered with dirt to hide it from the invading Spaniards and a small shrine was placed at the top, which the Spanish replaced with a church (Fig 4-1). The small portion which has been excavated reveals remarkable masonry (Fig 4-2). Mexico: The multi-platform style of the Pyramid of the Sun, Teotihuacan. In his discussion of Teotihuacan, John Michel (1995) quotes another researcher: "During the 1970s Hugh Harleston, Jr …established that ‘the basic unit of measurement at Teotihuacan was 1.0594 meters, the same unit which represents the ‘Jewish rod’ of 3.4757 ft., the same unit which represents the width of the Stonehenge lintels, a six-millionth part of the earth’s polar radius…’"
Peru: Pyramids of Cahuachi. A ceremonial site comprised of six pyramids, the highest being about 70 ft, overlooking a walled court of 4050 sq yards. (Morrison, 1988). 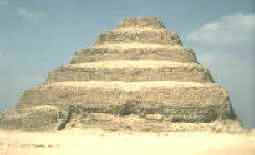 Hadingham (1987) mentions that the "great temple" was a stepped pyramid. He quotes Helaine Silverman’s estimate that the period of most activity at Cahuachi was short lived, about 200 years, and the site was mysteriously abandoned around 200 ad, along with other several other important sites. Peru: The pyramids of Tucume. "Covering over 540 acres and including 26 major pyramids as well as myriad smaller structures…first built around 1100 ad by people of the Lambayeque culture…" The largest of the adobe brick pyramids, Huaca Larga, is 2300 ft long, 910 ft wide and 65 ft high. (Heyerdahl, 1995). Robert Schoch (1999) writes, "The largest of the pyramids, called Tucume…was only a little over 200 feet high, but it contained one-third more volume that the Pyramid of Khufu at Giza." Polynesia: "modest pyramids" at Tongatabu; a temple-pyramid on Tahiti; the Langi stepped pyramid-platform at Tauhala (a large stone, 24 x 7 ft and weighing 30-40 tons, is in the wall). Canary Islands: The pyramids of Guimar. Thor Heyerdahl writes, "…They were painstakingly built step-pyramids, constructed according to similar principles as those of Mexico, Peru, and ancient Mesopotamia." Yonaguni: Situated between the East China Sea and the Philippine Sea, about 300 miles from Okinawa, is the island of Yonaguni-Jima. Off it's coast is a huge apparently manmade (god-made?) monument about 100 ft below the surface. 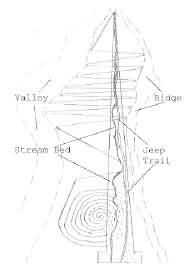 Its a platform pyramid 600 ft wide, 90 ft high constructed of precisely hewn megalithic stones. The pyramid, apparently a part of a ceremonial center, has been dated to 8000 bc, 5000 years before the oldest pyramid in Egypt! was the only one authorized to design the temples. He was likely the same "Greek divine craftsman Hepahaestus" who built the temple-abode of Zeus, and the Egyptian god Thoth). For Ninurta’s temple at Lagash Gudea was given elaborate and continuous instructions by the gods. He built a seven-tier ziggurat, named Eninnu, referring to a ingenious tablet which gave a plan view and 7 scales – one for each tier (Zecharia Sitchin describes this story in detail in his 1976 and 1993 books. See also figs 748, 749 of Pritchard, 1969). Zecharia Sitchin makes an interesting connection with his statement that the three great pyramids of Giza are at 52 degree, but the later pyramids collapsed at this angle and were built at 43.5 degrees, and he maintains that the pyramids at Teotihuacan are also at 43.5 degrees. Furthermore "although the 2nd pyramid at Giza is shorter than the Great Pyramid, their peaks are at the same height above sea level because the 2nd one is built on higher ground; the same holds true at Teotihuacan where the smaller Pyramid of the Moon is built on ground some thirty feet higher than the Sun Pyramid, giving their peaks equal height above sea level." We should note here also that both the Great Pyramid at Giza and the Sun Pyramid at Teotihuacan have a descending shaft burrowed into the bedrock on which the pyramids were built. The problem is better solved however by landing on step pyramids, or step platforms, since the tiers at each level would effectively deflect the exhaust (Fig 4-3). The pyramids of Mycerinus, Unas, Teti and most others also had underground chambers. In fact the pyramids of Mycerinus and some others did not even have chambers in the pyramids themselves - all chambers were underground! Obviously this design would make excellent bomb shelters, and I suspect that the large pyramids, and any hapless occupants, if they had been located at "ground zero" at Hiroshima or Nagasaki, would have survived. The pyramidal shape would have effectively deflected most of the blast wave and fireball, and the neutron and gamma-ray pulses would have been attenuated to negligible levels by the stone mass. Zecharia Sitchin (1985) offers a rather fantastic function for the pyramids of Giza: that they were built by the Nefilim, not by mankind, as part of a guidance grid for "the Tilmun spaceport". He develops a theory that ties the pyramids and the "sacred cities" into a guidance and communication grid for two approach corridors, one west-to-east over Mesopotamia and one west-to-east over the Sinai. "Built by the gods (Anunnaki), they were landmarks and beacons for the spaceport in Sinai, and existed long before kingship began in Egypt.
" The great pyramid was "…the mountain by which Utu ascends…". Incidentally Mark and Richard Wells (2000) have discovered an amazing similarity in the alignment and size of the three stars in Orion's belt and the alignment and size of the major pyramids at Giza, Egypt; Xi'an, China; Teotihuacan, Mexico. Don't miss their essay. Egypt, The Great Pyramid of Cheops: “…consists of 2.5 million stones 1 to 40 tons each. It takes a 300 hp diesel engine and hydraulic lifter to pick up a 7 ton granite slab”. Egypt, Aswan quarry: “The ‘Unfinished Obelisk’ near Aswan still lies in its quarry, detached on all but its lower side. If it had been extracted, it would have been 41.75 meters (137 ft) high with a base about 4.2 meters on each side. The total weight would have been about 1168 tons, heavier than any piece of stone ever handled by the ancient Egyptians”. Egypt, Karnak: “The seventh and last of the Karnak obelisks…is the largest surviving obelisk, with a height of 36 meters.” This 118 ft obelisk was removed to Rome in antiquity and now stands in the Piazza San Giovanni in Laterano. It was shortened to 32 meters (105 ft) when it was re-erected in the sixteenth century, and its current weight is 455 tons.” (Fig 5-2). 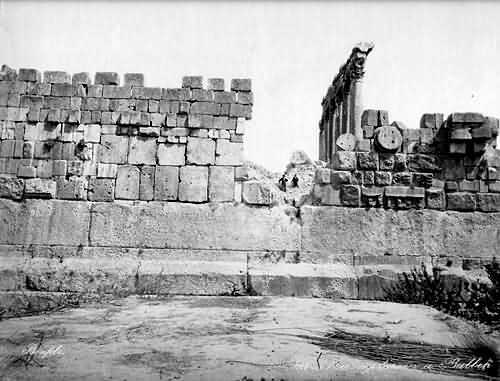 Lebanon, Baalbek: “…the colossal stones, the Trilithon, each weighs about 1100 tons; it is a weight no modern piece of equipment can even come close to lifting and moving.” (Fig 5-3). “None of today’s machines could move these megaliths. The largest block is 21 x 4 x 4 meters and the two others are 19.50 x 4 x 4 meters. Together they are 60 meter in length and 960 cu meters in volume. The blocks were quarried 400 meters distant." “The first of these blocks to the right (the Trilithon) measures 65’ in length, the second 64’10”, the third 63’2”. They were all 14’ 6 in height and 12’ in thickness”. 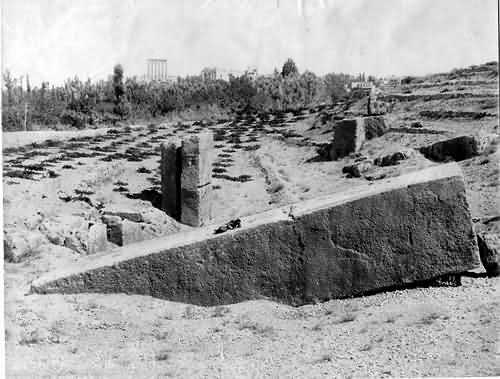 “…the stone in the quarry, Hajar-el-Hibla ("stone of the pregnant woman") is 69’ long, 16’ wide, and 13’10” high…this enormous stone weighs about 1000 tons” (Fig 5-4). Apparently this is the largest construction stone in the world. Click here for excellent photos of the Baalbek stones. Easter Island, Rapa Nui: Of the 300 standing statues the highest is 65 ft; of the 200 unfinished statues in the quarry, one would have been 164 ft high. Today, with high strength steel, we are able to move heavy objects on steel wheels, e.g. a 200 ton autoclave was moved 750 miles over US western roads on a rig having 112 wheels and powered by two large diesel tractors. However some things are too big to be moved on wheels, and instead steel rollers are used. The 198-foot-high Cape Hatteras Lighthouse was moved about a half mile during 1999. It weights well over 1000 tons. To move the lighthouse a compacted gravel road was built, on which large steel plates were placed. Steel rails were then set on the road plates in the direction of the move. To accomplish the move steel roller “dollies” were placed on the rails and were driven by powerful hydraulic rams. A total of 400 tons of steel was used directly under the light for support. The light would be moved a few feet and then the plates and rails behind it would be unbolted and moved to the front. Kiloton objects can also be moved on “tank tracks” which are essentially steel rollers running on steel tracks. Also steel cranes have been built which can lift several hundred tons. A New York engineering corporation has a huge hydraulic crane which can lift 500 tons, which is used to lift smaller cranes to the tops of buildings under construction. NASA constructed a crane having a lifting capacity of 430 tons, which is used to lift the shuttle during attachment to the fuel tanks. Its been suggested that the huge stones in place at ancient megalithic sites were moved around on wooden rollers. I think these authors are not aware of the relative strength of wood and steel. While a steel T-beam, mounted vertically with both ends fixed, can support a load of about 100 tons, a 10 inch diameter wood beam of the same length can only support about 10 tons. And if the wood beam is laid down so that the load is cross-grain rather than end-on, it will splinter under a much smaller load. Furthermore even if they don't splinter they will deform under the load and will slide instead of roll; this happened when 20 people tried to move a replica of one of the statues on Easter Island, and it only weighed 9 tons! So can we really imagine a group of prehistoric people sliding the 1000 ton blocks at Baalbek? Some Egyptologists suggest that the huge obelisks were moved on wooden rollers but not a single one has ever been found. Clearly it’s just nonsense to maintain that these stones were moved on wooden rollers. The first is that a technology comparable to our own existed at that time, employing high strength metal alloys, hydraulics and powerful engines. However, such a technology would involve the use of many materials, including gold and ceramics, which would last many millennia, and I am not aware of any reports of discoveries of any such artifacts. Additionally, since this technology existed all over the Earth, this possibility requires the difficult assumption that the members of this entire civilization disappeared, or at least “forgot” the technology, at about the same time, or in a worldwide conspiracy, disposed of all of the tools. This scenario seems highly unlikely. Giza, Egypt: “Then said Pharaoh, ‘Where lies the papyrus on which Imhotep wrote the words of power that went to the building of the pyramid for Zoser, yes and for that of Seneferu my father also…The words of power can be found and spoken by none but he-and if he speaks them three great pyramids shall rise at Giza and stand there forever. But if he speaks them not, all that you build, and your son builds and your son’s son after him shall fall and crumble away and become as the sands of the desert.’”(Green, 1967). At his "Giza Oracle" site Patrick Cooke presents a compelling argument that the Great Pyramid was not built by ancient Egyptians. Tiahuanaco, Bolivia: “…(the stones were) carried through the air to the sound of a trumpet”. Giza, Egypt: “…a magician was said to have raised into the air a huge vault of stone 200 cubits long and 50 cubits broad”. (Hancock, 1995). However with our current level of technology, ideas concerning anti-gravity and levitation take us into the realm of the supernatural, and so are out-of-bounds in these pages. The third possibility is that aircraft and cables were available at that time which had the power and strength to lift and move the stones. Of course we do not know for sure how these incredibly heavy stones were quarried, moved, and assembled, and short of a revelation, will likely never know. But we do know that even the heaviest construction today is not done with kiloton stones; it’s difficult, slow and expensive. Logically the only reason for the ancients to build with such huge stones is because it was easy for them to do so. Consider Baalbek in Lebanon where we find a huge platform which underlies, and predates, the ruins of the magnificent Roman temple of Jupiter. It contains the largest stones ever used in construction. How was it built? And by whom? - Childress (2000) mentions the Kebra Negast, the spiritual guide of the Ethiopians, which says that Solomon had a flying vehicle; also that there are hilltops in Pakistan and Iran where Solomon is believed to have landed. 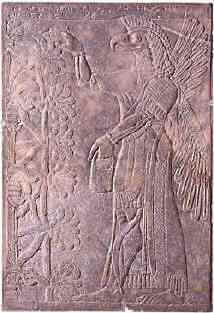 - By the tradition of the ancient Jews, Jehovah was not the only god in the universe, he was the “only god of this particular people”; and although by the act of the covenant the Israelites had committed themselves to the rule of Jehovah’s law, King Solomon (950 bc) had permitted the worship, apparently even in Jerusalem, of a rival god, Baal, whose main temple was at Baalbek (Baalath). - Near the Golden Gate (Jerusalem) is a small mosque, the “Kurst Suleiman”. Here legend tells us that, “King Solomon sat watching the Jann and Genii laboring to build his great monuments in Jerusalem, Baalbek, and Palmyra.” (Cornfeld,1972) (Jann were a type of Persian Genii, or "Genius", who had the annoying habit of stealing cows – to eat, I suppose). I conclude this page by speculating that the stones were moved by being suspended from powerful aircraft operated by the AA “geniuses”. Puedo estar loco, but the stones are there ! A unique characteristic of many of the megalithic sites is the polygonal stones which were used, the “Stone of Corners”. At Sacsahuaman, above Cuzco, Peru there is the stone of Hatun Rumiyoc, a huge polygonal stone with 12 corners, which interlocks perfectly with adjacent stones. Polygonal stonework was used at several sites in Peru (Figs 6-1,2 ), Greece (Fig 6-3), Lebanon (Fig 6-4), Turkey, Egypt and Bolivia, and Easter Island, among others. Also near the base of the Cheops Pyramid. 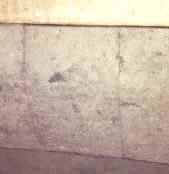 Another skill of the master mason was the use of single blocks carved as corners, in Egypt (Fig 6-7), and Peru, among others (see also Zink, 1979). So let's speculate about the technique of the master masons. 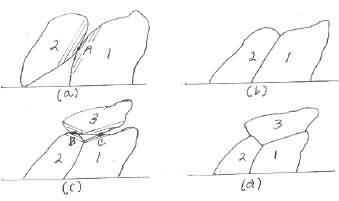 I’m inclined to think that the shaping and fusing of the polygonal stones might have been accomplished as follows: Two irregular stones are leaned against each other (Fig. 6-8a). A high temperature beam (acetylene or electric torch, laser, ion beam?) is passed back and forth across the contact point A of the stones, resulting in the first fused joint (b); a third stone is placed on top of the first two and high temperature shaving is performed at the contact points B and C (c), resulting in three fused joints (d). This scenario of course requires that we accept that the builders of these ancient, and mostly prehistoric, structures could easily pick up kiloton stones and place them on top of each other and could produce a beam sufficiently hot to fuse them together. I think they could. "Reality must take precedence over public relations, for nature cannot be fooled"
"Only within recent years, since the development of universal communications allowed us to compare the antiquities of our own countries with those of others, have we been able to see the extent of the vast ruin within which we all live. If we ignore all alterations to the landscape arising within the last three thousand years and consider the world as it must have looked in prehistoric times, the pattern that emerges is one so incompatible with our idea of civilization that it is easy entirely to miss its significance. For what we find is this: A great scientific instrument lies sprawled over the entire surface of the globe. At some period, thousands of years ago, almost every corner of the world was visited by people with a particular task to accomplish. With the help of some remarkable power, by which they could cut and raise enormous blocks of stone, these men created vast astronomical instruments, circles of erect pillars, pyramids, underground tunnels, cyclopean stone platforms, all linked together by a network of tracks and alignments, whose course from horizon to horizon was marked by stones, mounds and earthworks." In 1975 I flew over the Nazca plain in Peru, since the figures and patterns can only be recognized from the air, along with a small intrepid group of fellow mystery-mongers. 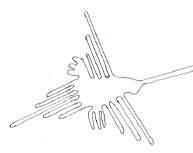 For me the Nazca lines represent the most persuasive piece of physical evidence in support of the Ancient Astronaut (AA) hypothesis. Although hundreds of writers have generated thousands of pages about the lines and figures, I have not been able to find a sensible explanation of how they were made, or by whom, or for what purpose. It seems obvious that the lines were made from the air. They could have been used as landmarks to be seen from space, or perhaps the AA’s were simply venting their artistic impulse on a convenient giant "etch-a-sketch"; however what I feel is most likely is that they used the Nazca plain to test and calibrate the instrument which they used throughout South America, and perhaps elsewhere on Earth, to delineate "roads" and radial "ceques" linking important sites. I think that the lines were probably created by using an instrument which could sweep away shallow paths of varying widths. I think "the sweeper" was probably something as simple as a high-pressure water stream operating in much the same way as we use a garden hose to wash gravel from our driveways. Certainly, with the Nazca plain bordering on the sea, there would have been a plentiful water supply. Some of the less precise drawings suggest that the sweeper might have been a gimbaled device which was guided by hand, similar to the machine-gun mounts on old bombers; however the great precision of many of the figures suggests that it more likely was a computerized device which used pre-stored images, such as modern computer driven routers. For these drawings the aircraft would have had to hover quite stably. Although most of the figures were simply outlined with narrow lines, the variable width feature of the sweeper, as one can also do with the nozzle of a water hose, permitted the drawing of "filled-in" figures. 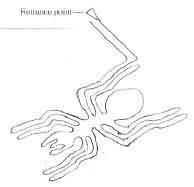 The 140 foot long spider (Fig3-2) is one of the best known Nazca figures. The lines which extend from the rightmost hind leg of the spider establish that the drawing begins at this point. The entrance line, the parallel line to the right, started with a broad beam which was focused to a line, and the hindquarters of the insect were drawn first. Most of the other animal figures were drawn in this same manner, with an entrance line, an continuous line sketch of the animal, and an exit line parallel to the entrance line. In Fig 3-3 the entrance-exit line-pair join the "hummingbird" at the beak. Apparently the AA’s sweeper helped the Incas create their remarkable 25,000 mile "road" system. Hadingham (1987) relates that "Along the north coast…several sections of Inca roads run for 25 miles or more with scarcely any visible deviation. The major coastal artery, in particular, often ignores minor geographic obstacles, passing straight over rocky hills rather than curving around them." Although the Nazca lines are the most famous, similar lines have been reported in Bolivia, the USA, Chile, and as "ley" lines in Great Britain. Other huge ground drawings can be found on the 2000 ft high Atacama Desert in Chili, about 600 mile south of Nazca. The desert is literally covered, for many miles, with "geo-glyphs". Together they constitute the "zoo of the Atacama", immense stylized figures. Traveling another 250 miles south, in the region of Tarapaca province, on a mountain called Cerro Unitas, we find the "giant", a huge (600 ft) ground figure with "antennae" radiating from the side and top of it's head. The drawing "cannot be recognized from the ground since it wraps up over the crest of the mountain." (Clarke, 1982). This I take to be hard evidence that these figures were created from the air. It’s location next to the "lone mountain" also suggests that it was a beacon. It is the largest known ground drawing of a stylized figure. Zecharia Sitchin (1980) writes about the 30th parallel, reporting that on this line lie the Tilmun site and the "sacred cites" of Giza-Heliopolis (Egypt), Eridu (Mesopotamia), Persepolis (Persia), Harappa (Indus valley), and Lhasa (Tibet). He further suggests that "Indeed, were we to study all these sites, all of Earth would probably be encompassed." The Nazca desert - a testing and calibration site for the devices used to mark the Earth? by AAs? from the air? I think so!